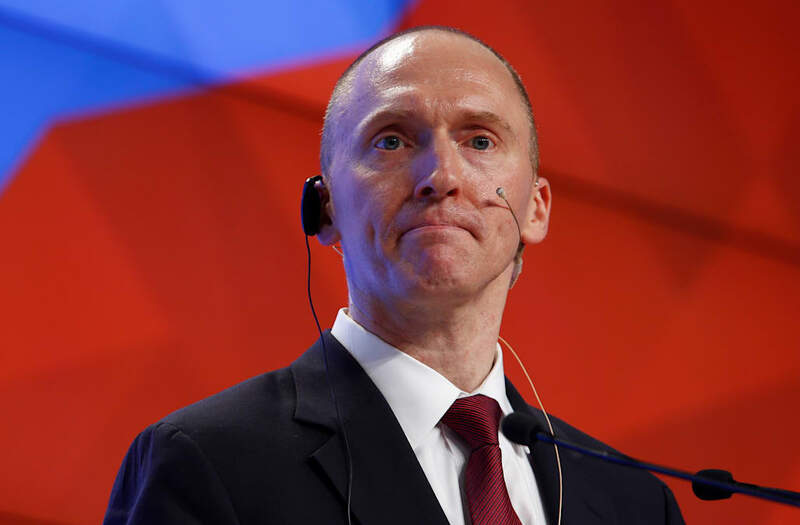 The FBI obtained a FISA warrant last summer to monitor the communications of Carter Page, who was an early foreign-policy adviser to Donald Trump's presidential campaign, The Washington Post reported on Tuesday. The energy-consultant-turned-foreign-policy adviser was named in an unverified dossier about President Donald Trump's ties to Russia as a liaison between the Trump campaign and Russian officials. His trips to Moscow and contact with at least one Russian official last year are now reportedly under FBI investigation. The dossier alleged that Igor Sechin, the CEO of Russia's state oil company, offered Page and his associates the brokerage of a 19% stake in the company in exchange for the lifting of US sanctions on Russia. The dossier says the offer was made in July, when Page was in Moscowgiving a speech at the Higher Economic School. Page has called accusations that he served as a liaison an "illegal" form of "retribution" for the speech, in which he slammed the US for its "hypocritical focus on ideas such as democratization, inequality, corruption, and regime change." Page told Business Insider that he "was so happy to hear that further confirmation [of surveillance] is now being revealed. It shows how low the Clinton/Obama regime went to destroy our democracy and suppress dissidents who did not fully support their failed foreign policy." Page told BI that he believes the FISA requests were "unjustified." But the government's application for the FISA warrant targeting Page, The Post reported, has been renewed more than once, and "included a lengthy declaration that laid out investigators' basis for believing that Page was an agent of the Russian government and knowingly engaged in clandestine intelligence activities on behalf of Moscow." There were contacts Page had with Russian intelligence officials that he did not disclose, according to The Post, and unanswered questions about a court case involving a Russian spy who tried to recruit him in 2013. BuzzFeed News obtained the court filing for the case, which included a transcript of a conversation between Victor Podobnyy, the person accused of spying, and Igor Sporyshev, another Russian operative, about trying to recruit someone identified as "Male-1." Page confirmed to BuzzFeed that he was "Male-1." But he said in a statement later that his personal identity was made "easily identifiable" in the court documents because the US government wanted to punish him for his "public positions of dissent." Page found himself at the center of a Russia-related firestorm in late February after USA Today reported that he met Russia's ambassador to the US, Sergey Kislyak, during an event at the Republican National Convention. At least two other Trump associates, former adviser J.D. Gordon and then-Sen. Jeff Sessions, now the US attorney general, also spoke with Kislyak at the convention. The White House has distanced itself from Page, insisting that he was an "informal" adviser to the campaign who left in early September. Page had no badge, an administration official told Business Insider last month, and never signed a non-disclosure agreement — two requirements of anyone working with the campaign in an official capacity. He also wasn't on the campaign's payroll, the official said, and did not have a campaign email account. The Senate Intelligence Committee, which is investigating Russia's interference in the 2016 election, has asked Page to preserve all information related to contacts with Russians during the campaign. He volunteered to be interviewed by the committee last month.